Believe it or not, the feeling of sand between the toes on a sizzling beach is not for everyone. For some, when the sun’s shining, they prefer to keep their shoes on and go for a stroll in the hustle and bustle of city streets, like Niagara Falls. Understandably, there’s something about the dazzling lights and sounds of the city that is energizing, entertaining, and upbeat. That’s why, every year thousands of tourists and local residents come to experience the world famous attractions, restaurants, and bars in Niagara Falls. It’s a great place to simply unload and indulge in great food and entertainment all within walking distance from the Falls. 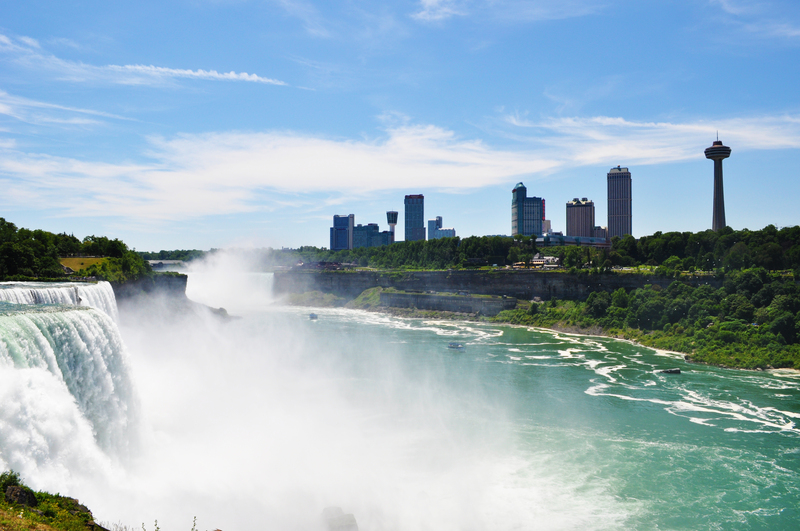 Very little planning is needed to plan a visit to Niagara because there’s just so much to do including, open areas like parks and nature trails along the Falls for everyone to enjoy. However, there are certain things you’ll want to reserve in advance to ensure you make the most of your time in Niagara, like your hotel stay and reservations to premium restaurants and bars like, Coco’s Steakhouse on nights with live entertainment and cocktails out on the Terrace. The best part about being in the city is how you can walk a short distance and experience so much to see and do along the way like, on Clifton Hill. Play classic midway games like skee ball and so much more at the Great Canadian Midway, win tickets and redeem them for awesome prizes. The Niagara Parks Adventure Pass is a great way to experience the best of Niagara Falls with attractions like the Journey Behind the Falls, the Hornblower Niagara Cruises, the gem of the Parkway the White Water Walk ( ok not walking distance but a short WEGO ride) and the multi sensory Niagara’s Fury. The Wildplay Zipline offers an amazing view that is sure to take your breath away. Don’t forget the stunning views of the nightly illumination to take in and the stunning fireworks displays over the Falls. Cool off in the mist along the Falls, the best place for photo taking and sharing on social networks. There are so many great spots to picnic along the Falls in Queen Victoria Park with grassy areas and trees creating a comfortable shade from the sun. Pack some snacks and drinks, lay out a blanket under a tree, and simply enjoy the gorgeous weather with the beautiful Falls in the background of your perfect day. Spoil yourself with a new summer outfit, jewelry, or maybe some sweets from the gourmet candy shop in the Fallsview Mall. Located alongside the entrance of the Fallsview Casino, in the A/C-friendly building, so you can stay cool while you shop. Enjoy beers, cocktails, and wine out on the Terrace at Coco’s Steakhouse, a premium restaurant and bar in Niagara Falls. Located directly across the Fallsview Casino and walking distance from the Falls. Coco’s Terrace serves wine from Niagara’s own quality wineries and a wide variety of cocktails including Coco’s original martinis. Take advantage of patio season while you can and say cheers to creating summer memories on Coco’s Terrace. Summer is the only other time besides Christmas that you can truly indulge in good eats and not feel completely guilty about it. When the weather outside is great, you feel more inclined to do the things you love, even if that means eating the tastiest meals and satisfying your cravings. You’ll just tell yourself, “Hey, it’s summer right? !” Well, at Coco’s Terrace, we understand the need to truly indulge which is why we serve the tastiest gourmet wood-fired steaks and pizzas on our Terrace. If you never tried wood-fired pizza before, it’s a must. Every bite has a hint of smoke complete with the freshest toppings. If you’re on your way to Niagara Falls this summer, contact us to reserve a spot on Coco’s Terrace Steakhouse!